Channel Club is a new residential community located in the Channelside district of Tampa, Florida just minutes away from the Florida Aquarium. It is another unique development from ECI Group offering luxury apartment homes with an eclectic Tampa flair. Channel Club will sit on a two-acre site at the corner of Twiggs Street and Meridian Avenue with additional frontage on Madison Avenue. 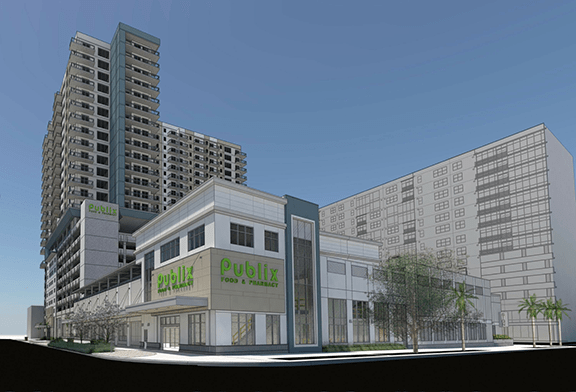 The asset will feature 323 units in a 15-story tower that sits atop a 7-story parking garage. In addition to the parking garage, the project will include a first floor lobby, mezzanine level for storage, and a pool/amenity deck. The building will be a post-tensioned concrete high-rise structure with a metal stud framed exterior wall with drainable exterior insulation system for the exterior skin. The current unit mix includes 235 one-bedrooms and 88 two-bedrooms. The garage is connected by elevator to the rest of the building and includes 542 parking spaces. Of these spaces, 443 will be reserved for apartment residents while 99 spaces will be reserved for patrons of the attached 29,000 sq. ft Publix grocery store. 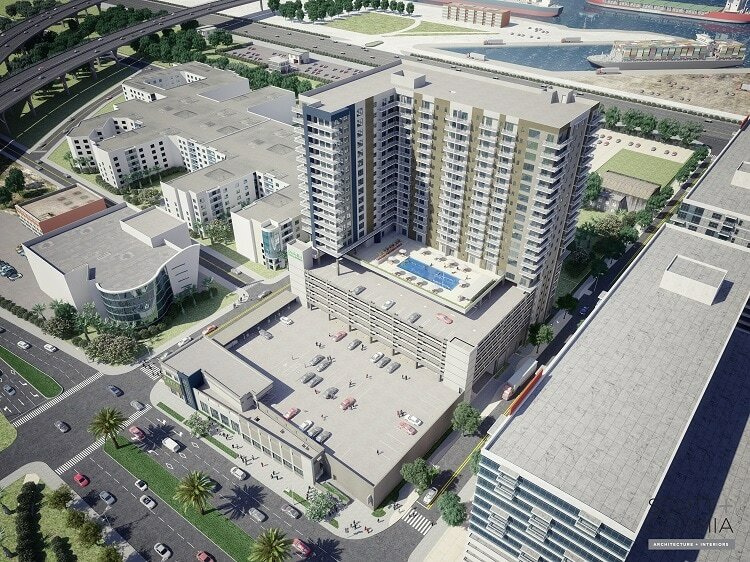 The units will feature high end finishes including granite countertops, Energy Star stainless appliances, tiled backsplashes, vinyl plank, carpet and tile flooring, frameless glass showers, garden tubs, expansive floor to ceiling window walls and panoramic views of Tampa’s midtown and downtown skylines. The site is close to I-275, I-75 and I-4, which provides for convenient access to employment centers, transportation arteries and the Tampa International Airport. FMG Design has been commissioned to provide a logo, a comprehensive program of environmental graphics, and public art for this upscale development. The development of public art will enhance and humanize the public realm in private development and in the city of Tampa by providing free visual access to artistic excellence. But most importantly, it will support the promotion of the downtown as the cultural center of the region.